WINDSOR, ON – Walkerville Brewery has announced the upcoming release of a beer that has already won an award before being available to the public. 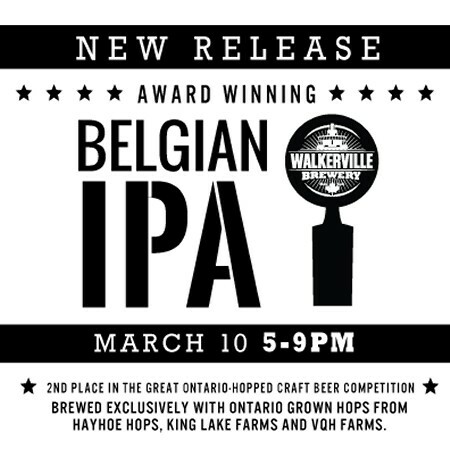 Walkerville Belgian IPA took a second place medal at last month’s Great Ontario-Hopped Craft Beer Competition. Like all beers in the contest, it was brewed using hops from Ontario farms – in the case of Walkerville, partner farms included Hayhoe Hops, King Lake Farms and VQH Farms. The commercial release of Belgian IPA will take place tomorrow (Friday March 10th) at 5:00 PM at the brewery. For more details, see the Walkerville Brewery Facebook page.